You cannot please everyone...including those whom you think have been appreciating you all the time. Spending too much attention to a specific person would make you cynical and would make you forget the rest of the people who are sincerely appreciating you. That hurts very badly. This issue still underlies in the category of EXPECTATION. This word must be boldly written so that every one would realize that too much expectation for something or someone would just lead you to brokenness and frustration. No body ever told me before that such kind of mentality would lead to such pain. My mother did not warn me when I was a kid about this. My father did not give me an advise on how to overcome such. Well, maybe I have to do this on my own. I am a grown-up now, and I have to practice independence, in almost all aspects, I suppose. I believe it's not only me who suffers from this wrong impression of expecting. But when it comes to pain and grief, I always alone. And I have to suffer the consequences solely. 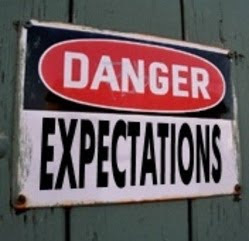 This does not mean that the whole EXPECTATION thing is bad. I am not telling you to stop expecting. It's just that you also have to reserve something for yourself. You must not give your whole intellect on such mentality. Expecting for something adds to your excitement but if ever such thrill won't be realized, be sure you have fixed yourself to the "It's okay" mode and not on the "Emote agad" button after the damage has been done. That way, you will not be wasting your insipid tears.